Demands on access networks are increasing at an accelerating rate, requiring a clean-sheet approach to a truly scalable multi-service architecture. Zhone's MXK intelligent terabit access concentrator reflects this new approach, with non-blocking capacity of up to 3,600 100Mbps GPON subscribers or 360 1G Active Ethernet subscribers per chassis. Beyond sheer bandwidth, MXK platforms leverage Zhone's well-proven SLMS access operating system for sophisticated service intelligence, to guarantee high quality of experience for subscribers, along with ease of management to address rising costs of network operation. The MXK delivers these fundamental advances in access networking while meeting the full spectrum of baseline carrier-class requirements for multi-service hardware and software. For residential triple play and high-bandwidth business services over any FTTx architecture, the MXK solution sets a new performance benchmark for the industry. The MXK family offers a wide range of options for FTTx solutions. It supports Active Ethernet and GPON line cards, and interoperates with indoor and outdoor ONTs. 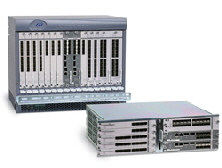 Supporting Active Ethernet and GPON on the same chassis allows service providers to configure their networks with maximum flexibility and efficiency, using a combination of GPON splitters and dedicated fiber connections. The MXK family includes three fully-integrated form factors: 319 (19" rack x 3RU, with 7 slots for line cards), 819 (19" rack x 8RU, with 14 slots for line cards), and 823 (23" rack x 8RU, with 18 slots for line cards). The chassis support both front and rear power options and are equipped with a cable management tray, easy fan access, and redundant power feeds. MXK uplink cards offer a mix of multiple 10G and 1G interfaces to suit a variety of network designs. The two configurations currently available are 2x10G + 8x1G and 8x1G. The cards support both copper and fiber SFPs, link aggregation, link redundancy, and the EAPS ring interface. The MXK platform supports GPON and Active Ethernet line cards today and is designed for seamless, same-chassis support of ADSL2+, VDSL2, and G.SHDSL EFM as those line cards become available in the coming months. The 4- and 8-port GPON OLT line cards provide standards-based support of 2.5Gbps downstream and 1.25 Gbps upstream bandwidth. The largest MXK chassis can support up to 9,216 ONTs using Class B+ or C optics. The Active Ethernet line cards provide up to 360 ports per chassis of 100/1000BT copper or 100/1000Mb fiber-based services. Operators can use a wide variety of SFPs on the same card. Zhone's SLMS (Single Line Multi-Service) access operating system provides intelligent functionality across all the company's hardware products. Driven by 8 years of experience in commercial operation and collaboration with 700+ service providers worldwide, Zhone's SLMS delivers functionality critical to today's access networks in advanced networking, quality of experience, voice, security, and management. To maintain tight security in the last mile, the MXK platform mounts considerable defenses, powered by all of Zhone's SLMS security features, including multicast control lists, secure bridging, broadcast suppression, dynamic IP filtering, SSH and SFTP, and RADIUS authentication. The MXK product line integrates fully into the Zhone Management System (ZMS). Using ZMS, thousands of MXK nodes can be managed from remote locations. Customer provisioning, auto discovery, alarm aggregation, and maintenance can easily be performed without any service interruption. Unlike vendors who have dodged the complexity of the ITU's G984.4 standard for GPON ONT management, Zhone provides a simple and clean interface to a fully standards-compliant OMCI implementation. Zhone's Smart OMCI(TM) approach allows the MXK OLT to interoperate with any vendor's ONT, yielding rapid ONT and service extension without OLT software upgrades. With Smart OMCI you can configure, obtain stats and support alarms on any ONT without hassle. Zhone offers a full line of outside cabinets engineered specifically to support MXK platforms. Multiple configurations are available for deployments from small to large scales, with a wide range of powering, protection, and line termination options.